The NVidia GeForce GTX 260M is a high-end graphics card of the 200M series based on the G92b core. Therefore, the 55nm chip is essentially a 9800M GTX with slightly higher clock rates (550/1375/950 vs. 500/1250/800). As a result, the 260M is more similar to the desktop 9800GT than the GTX 260. As with all native DirectX 10 cards, the GeForce GTX 260M renders 3D images using "Unified Shaders". Dedicated pixel shaders and vertex shaders have been replaced with 112 stream processors in the 260M, which now take over most of the graphics workload. The shader units themselves are also clocked higher (1375 MHz) than the core chip. In general, the performance of the GTX 260M is somewhat higher than the 9800M GTX due to the higher clock speed. For current DirectX 10 games such as Crysis, World in Conflict, Bioshock or Age of Conan, the 260M is sufficient for gameplay under medium to high detail settings. Meanwhile, older games should be able to run fluently under high resolutions and full details. VRAM can be up to 1024 MB GDDR3 at 950MHz in MXM 3.0 or 800MHz in MXM 2.0. The GeForce GTX 260M integrates the PureVideo HD video decoder. The GPU is thus able to assist the CPU in the decoding of H.264-, VC-1-, MPEG2- and WMV9 videos. HybridPower is a Windows Vista-only technology that allows users to switch between the integrated and dedicated graphics core for power-saving purposes. In the future, Nvidia intends to evolve the software for automatic switching depending on the active application (now known as Optimus). GeForceBoost is not supported with the GTX 260M as there would be no performance gain from combining with the integrated GPU. The high current consumption of up to 75 Watts (of the entire MXM board) means that the GTX 260M can typically only be found in larger notebooks with loud and powerful cooling systems. Compared with Desktop graphics cards, the GTX 260M is most similar to the GeForce 9800 GT. The NVidia GeForce GTX 280M is a high-end graphics card as part of the 200M series and is based on the G92b core (Desktop GeForce 9800 GTX+). Therefore, it is actually more related to the GeForce 9800 GTX+, both performance-wise and architecturally, than to the GTX 280. The chip is produced in 55nm with all 128 pipelines enabled, as opposed to the GT 9800M with only 112 pipelines produced in a 65nm process. As with all DirectX 10 graphics cards, the GeForce GTX 280M renders 3D images using "Unified Shaders". Dedicated pixel and vertex shaders of yesteryear are gone in favor of 128 stream processors running at 1250MHz on the GTX 280M. The stream processors handle all of the workload that would have otherwise been processed by pixel or vertex shaders. VRAM can be up to 1024 MB GDDR3 clocked at either 800MHz (on MXM2 boards) or 950MHz (on MXM3 boards). Due to the full 128 shader cores, the GTX 280M is about 10-25% faster than the older 9800M GTX and slightly faster than the 260M. Compared to the performance of the Mobility Radeon HD 4870, the GTX 280M is about equal in synthetic benchmarks, if not slightly lower. The Nvidia card, however, has proven to be slightly faster in games, so the GTX 280M can therefore be rated more highly in terms of real-life performance. Specifically, games with PhysX support (e.g., Mirrors Edge) can have significant performance advantages if PhysX effects are enabled. Another feature of the GeForce GTX 280M is the integrated PureVideo HD video processor. The card is able to assist the CPU in decoding of H.264-, VC-1-, MPEG2- and WMV9 video material. HybridPower is a Windows Vista-only technique used to switch between the integrated (only with Nvidia chipset) and dedicated graphics cores for power-saving purposes. Eventually, Nvidia will have its future chips switch automatically between dedicated or integrated through drivers (now known as Optimus Technology). GeForceBoost is not supported with this card, as there would be no performance gain from combining the integrated GPU with the discrete video card. A high power consumption of up to 75 Watts (including the VRAM and MXM board) means that only large notebooks with powerful (and possibly loud) cooling systems can run the GTX 280M. 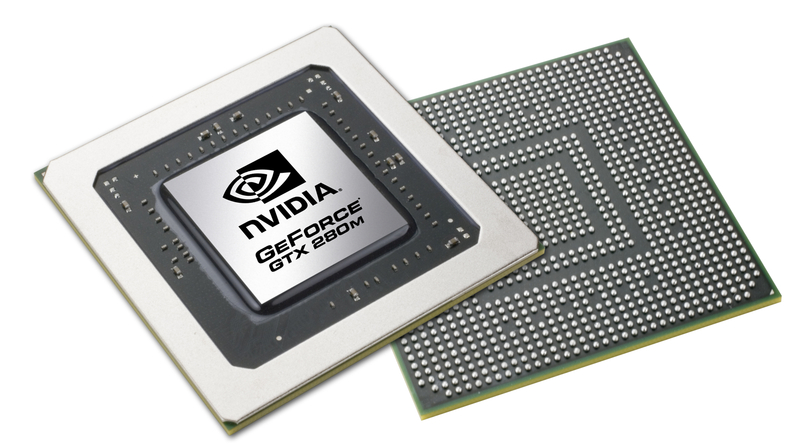 The newer GTX 285M is based on the same core as the GTX 280M, but with only slightly altered clock rates. As a result, the performance of the GeForce GTX285M is very similar to the GTX 280M. Compared with Desktop graphic cards, the performance can be considered somewhere in between the 9800 GT and the 9800 GTX, the latter of which has considerably higher clock rates at 675/1675/1100MHz.